Proudly bearing the label 'Rat Kid', Gustavo has lived in Mexico City's parks and sewers since he was just eight years old, when his 'evil stepmother' kicked him out of the family home. Now 18, he says the past decade has taught him the skills required to survive on the tough streets of Mexico's capital. 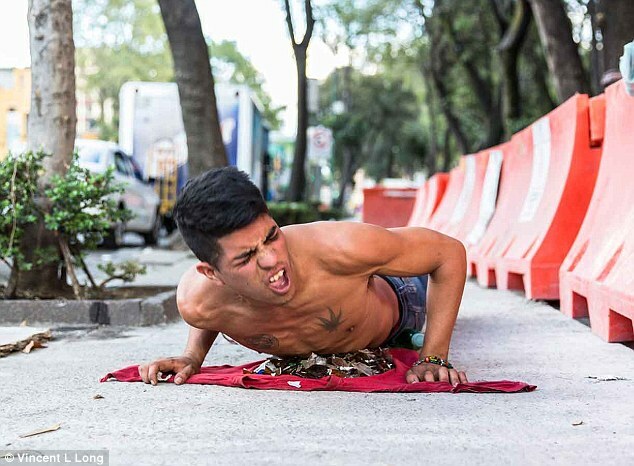 The young man currently makes $10 a day performing on the city's metro, prostrating his naked torso across shards of broken glass and then asking for donations from horrified passersby. 'Staying alive in this town means putting your body on the line,' he told MailOnline, speaking from the encampment where he and 14 other abandoned children now live. 'I've done everything from washing windscreens to selling my body to perverts,' he says, inhaling deeply from a solvent soaked rag in his clenched fist. 'We do whatever it takes to make a dollar.' Gustavo, who lives by the motto 'you can never trust anyone', is one of over 15,000 homeless under the age of 18 living on the streets of Mexico City. 17-year-old Emilia lives alongside Gustavo in their encampment in La Ciudadela Park in Mexico City, a fifteen minute walk from the famous Zocalo square. Unable to find honest work as a pregnant 13-year-old, Emilia gave birth to her son in a Mexico City sewer four months after she arrived in Mexico City. Her child never stood a chance on the rough streets of the capital. Within six months, the baby boy died from heart failure, killed by the fumes of a solvent being inhaled by 29 other homeless people the mother and son shared a confined space with. The substance that killed Emilia's son was toluene, a colourless liquid used to make paint thinners, glue and disinfectants. It is common amongst the down-and-out of Mexico. Users breath the harmful and flammable liquid - which they refer to as 'activo' - through a bottle or a soaked rag - known as a 'mona' - to induce an addictive feeling akin to drunkenness. The prostitution is not limited to the young girls. Since the homeless children set up camp in La Ciudadela, the once-popular inner-city park famous for nightly Danzón dance practice, has become a seedy hotbed of sexual deviance. 'We've had men coming into our tents and choosing whomever they want,' says 15 year-old Donny, who has lived in the park for more than two years after his parents died and his family refused to take him in. The Mexico City authorities turned a blind eye to the occupation of the city's sewers and storm drains by homeless for many years. But they were forced to act in 2013 when more than 30 homeless people were found dead in a chamber underneath a roundabout on the city's main Reforma thoroughfare. Purging the city's underworld scattered the homeless across the capital. Many of the minors landed in La Ciudadela Park where a thriving dance scene, local schools and a famous market have suffered as a result of their presence. Lilia Velazco, who has lived across the street from the La Ciudadela park for over thirty years, said her neighbourhood has become a 'living hell' since the homeless minors were left alone to set up their tents three years ago. Lilia says that her neighbourhood has become a hotbed of crime. 'They cut down the park's trees to start their fires, they burn plastic bottles and the fumes come into my apartment, they sleep all day and then come out at night to rob and terrorise the local residents,' she said. 'We're living in hell but nothing is being done about it,' she says. Many of the 'Rat Kids' - name given to Mexico City's homeless minors by the local residents - end up on the streets after their parents remarry. Others have been victims of organised crime. Alejandro, who comes from the dangerous Tierra Caliente region of Michoacán state, was chased out of his hometown after an opposing gang murdered his drug lord father and the rest of his family. Now forced to live on the streets of the capital, he says that the 14 other people he sleeps alongside are the only protection he has against the brutal underworld in which he lives. Juan Antonio Cruz, known as 'El Sin-K', is a local gang member who extorts the homeless around La Ciudadela for protection money. 'I protect them from everyone who is trying to kick them out,' he told MailOnline, pulling deeply on his own solvent-soaked rag.